Besides the good old hobby knife, there are cut paper artists using scalpel. I had not cut with scalpel before but am cutting a new piece with it now. Someone sent me the surgical scalpel with Zirconium Nitride coating on the #11 blade, the same coating that makes the blade sharper and stays sharp longer. After cutting with it for a couple of hours last night, it felt extremely sharp I must say and I have not switched to a new blade so far. The blade and scalpel are designed for surgeons but who is to say I am not one? I just operate on paper. 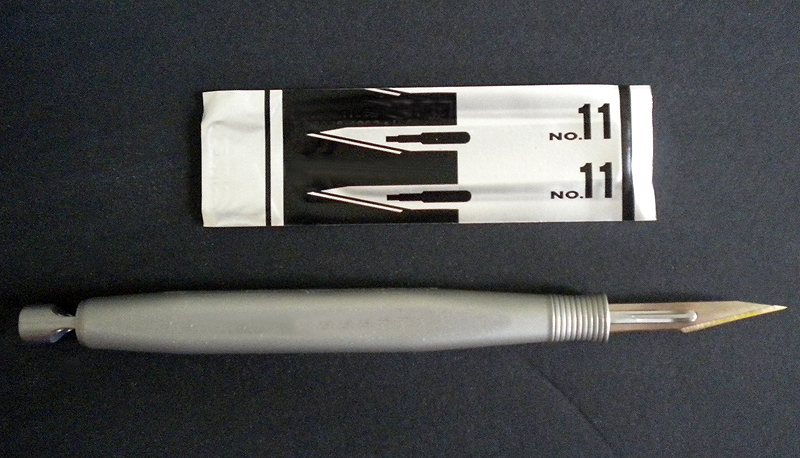 * model names and numbers on scalpel and blade have been digitally removed. When was the last time the #11 blade made an improvement? I have been using the same one made of carbon or stainless steel since I was a kid. 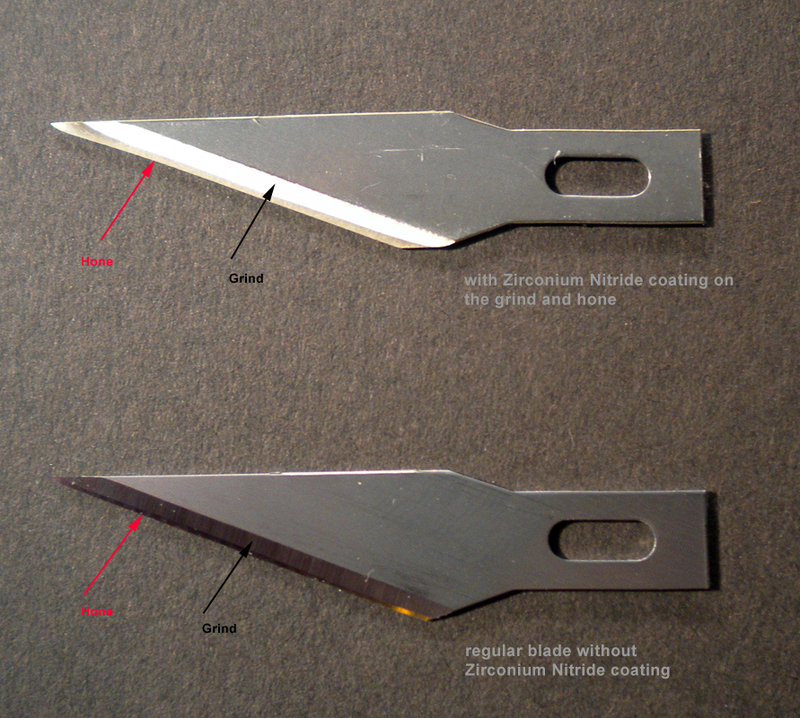 The Z series blade, as X-Acto named it, is probably the biggest change in a long time. The Zirconium Nitride coating is on the grind and hone of the blade. According to X-Acto’s project engineer I spoke with, the coated blade is at least 4 times sharper and stays sharper minimum 6 times longer than a regular blade. Its performance has been consistent when tested against copy paper, cardboard, balsa wood, and many other materials. Here’s a picture I took comparing the Z series blade with the regular variety. Because the coating is only on the grind and hone and not on the body of the blade, it allows the blade to bend but not snap if/when under too much pressure and therefore is safer to use. Zirconium Nitride is a hard ceramic. When applied using the PVD process (physical vapor deposition) done in vacuum chamber, it is usually coated onto metal surfaces for heavy use and wear including drill bits and medical devices, according to Wikipedia. The new #11 blade uses the same process. I did a quick test cutting a small pattern using the Z series blade the other day. I cut a small pattern on one sheet of rice paper with silk backing, the same variety I typically use for my works. I didn’t feel that it cut any sharper than the regular variety. I have not used it to cut thicker or harder materials. The new blade looks different and has a slight golden sheen. To give a fair assessment, I will have to use the Z series blade longer and make more cuts to test its longevity and sharpness. As a cut paper artist using lots of blades, I am excited about a longer and sharper blade that could be more cost-effective and environmental friendly. The project engineer said that the Z series blade is more expensive (guessing 20-30%) than the regular variety. It will launch in North America in September, 2011. 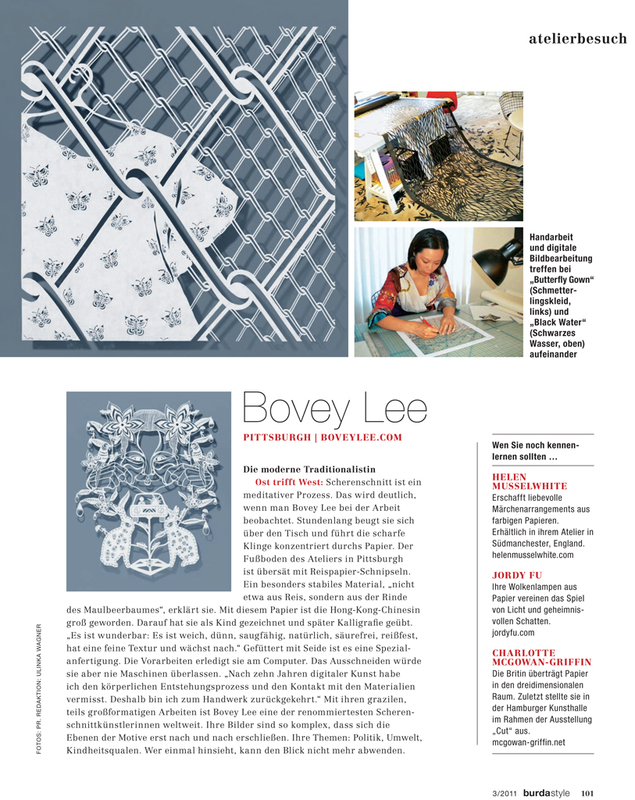 Burda Style is Germany’s most popular DIY magazine. 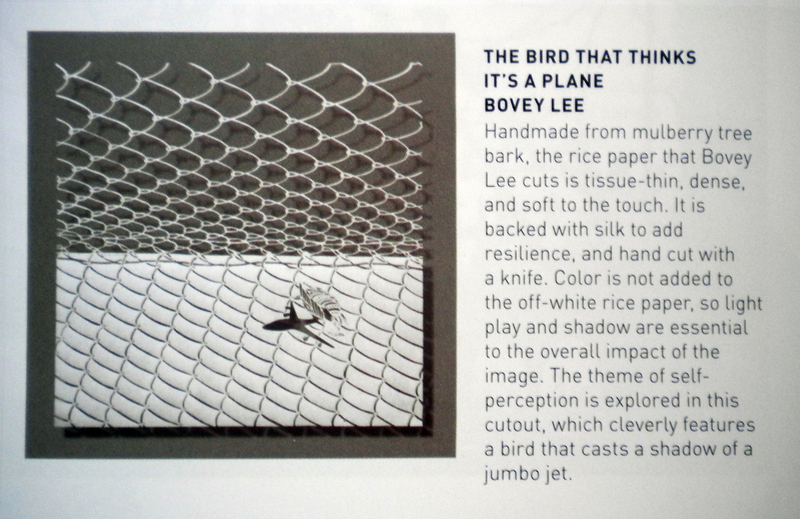 It featured my cut paper works and artist profile in the March 2011 issue.